This is clean, Really. I have so many other things I want to do to this space. I still have boxes of craft supplies in the basement that I have no room for in this loft, not to mention fabric still in my sister's basement (sorry Nealie). 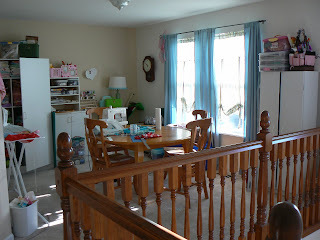 I would love to get the wall painted that the window is on, but it is on the wall that the 2 story open entry is on. We need to get some fancy scaffolding or something in order to do it. Also I have some projects in mind for idea boards and things like that. I love seeing into other people's spaces (that is why I became a Real estate agent for a short time :) ). Here is the view from my trusty old machine. 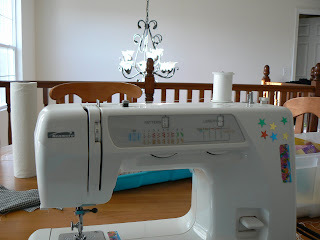 I really would love a new machine, but it is not in the budget right now (I am not sure it ever will be in this economy). Gina decorated it with a few shiny stars. I used some fancy Lisa Frank bee tape to mark some seam allowances on it like 8 years ago. I do have a special relationship with this machine, it just doesn't do all that I wish it could. 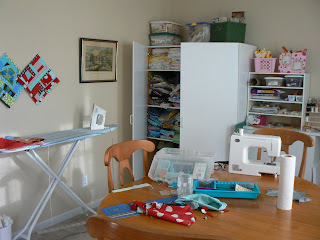 Well that is a little glimpse inside my world, I would love to see inside your "studio" too. It is so neat to see into other people's crafting worlds. I love the openness of yours and it seems so organized! I can't find your email anywhwere so I'll just say hello here and thank you for stopping by my little blog! Yes you did see birdies in my stash today. My first birdies aquisition that I purchased. I've recieved a few in swaps. I may be hooked on birdie fabrics! I swear it's an addiction. What a great place to be creative. Lucky you! What a great space! I covet it. So much light.